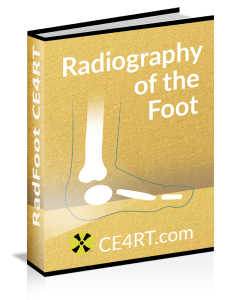 If you are working as a radiologic technologist or ultrasound tech, you spend long hours on your feet and on hard floors. Footwear is an important part of your life and we all know that if we skimp on quality in this area, we will end up with sore feet every day in the short run and serious foot, knee, and back problems in the long run. In addition, an X-ray tech’s shoes need to be spill, sharps, and slip resistant, and need to be easily cleanable on the outside. But that doesn’t mean they have to be ugly. Standard tennis or running shoes can be comfortable, but they don’t look professional. The soft pourus top makes them unsafe for dropped sharps or spilled fluids. Also, sneakers are hard to clean and shoe laces can come untied and get dragged across a contaminated hospital floor. But shoes are a personal trial and error thing. One person’s best shoe ever may not work for someone else. What are your favorite work shoes? Danskos are the crème de la crème in comfort, combined with orthopedic foot support with a seal of acceptance from the APMA. 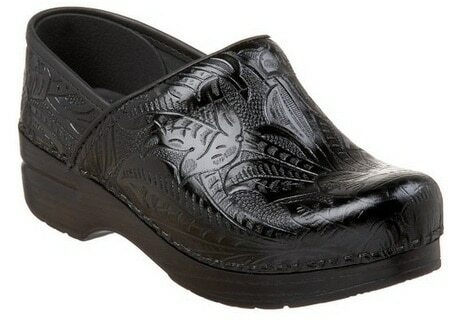 Enjoy the sturdy construction and fashionable appeal of Dansko women’s clogs in patent and tooled leather clogs. If you are looking for a unisex fit, enjoy the Dansko Professional Danskpro clog in box leather which is easy to clean. Dansko’s Professional Clog collection has a polyurethane rocker-bottom sole, designed to protect the feet, legs, and back from the stress of standing or walking, and to propel the foot forward, helping you stay on the move. Gorgeous tooling detail defines the Dansko Professional Tooled. Set in a leather upper, this women’s shoe features a gorgeous embossed design. This Dansko clog also has all the comfort features the brand has come to be know for – firm foot and arch support, a contoured midsole, shock absorption, a rocker sole and roomy toe box will keep your feet comfortable! 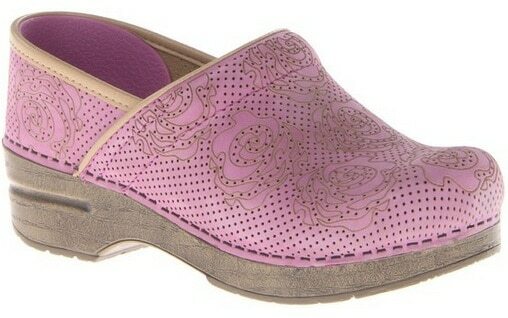 Don the beautiful Dansko Professional Tooled with confidence! Look your best in the handsome style of the Dansko Pro XP Men’s clog in ebony or espresso. Proudly boasting the best of Dansko foot technology, this stunning men’s slip-on is sure to exceed expectations. Featuring a high quality leather upper that is easy to maintain, it also boast of a clean and modern design that will instantly upgrade any outfit. Removable memory foam footbed provides ultimate comfort, while non-slip rubber outsole provides the perfect amount of traction and stability you need during your busy day. The Dansko Pro XP Men’s is perfect to pair with any office attire for a more polished look. Stay ready for whatever your day holds with the striking Dansko Pro XP Men’s. The Angelique is comfort-minded style. The breathable lining wicks moisture away. It is designed with a padded footbed for comfort. The contemporary platform helps propel the foot forward as you walk. The slip resistant outsole ensures multi-surface traction. Available in glossy black or white, purple floral, and pink or blue snake. Sanita has been making cozy, comfortable clogs the Danish way since 1907. That tradition of craftsmanship and caring lives on today in every clog they make. With innovative design and exacting standards, their shoes are always easy on your feet. With attractive new styles every season, they are also easy on the eyes. The Sanita Professional Bonnie women’s casual is a stylish shoe with metal studs on the sole. This women’s casual has a cabrio leather upper. To provide the feet with interior comfort synthetic lining has been provided. Traction control is taken care of by the slip resistant PU outsole. The metal studs adds to the charm of the Sanita Professional Bonnie women’s casual. Sanita’s footwear has evolved from its handcrafted roots into what is globally known as their Original stapled clog collection. This collection is designed around the foundation of the sole, creating a subtle rocking motion that actually propels youforward while taking pressure off each step. This movement reduces the strain on lower back and legs, so you can live a lifestyle dedicated to comfort. This collection is designed specifically around the foundation of the sole, creating a subtle rocking motion that actually propels you forward while taking pressure off each step. This movement reduces the strain on your lower back and legs, so you can live a lifestyle that allows you to feel good – all the way down to your toes! 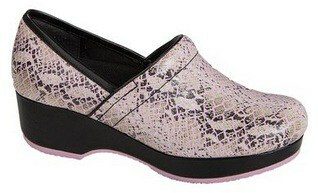 Printed patent leather upper. 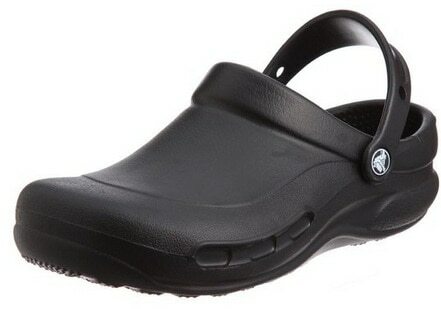 Crocs are the Classic unisex clog available in assorted colors. Some people swear by them and other’s don’t like them. Men’s and women’s Crocs mold to your foot and provide long lasting comfort for standing on your feet for long hours. 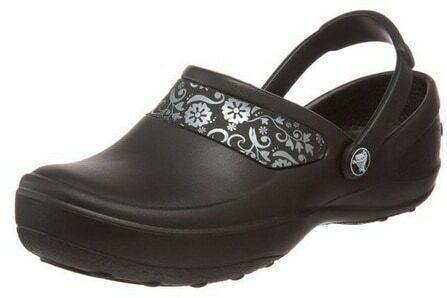 Crocs are also ideal for medical professionals because they have swivel straps for great support when walking. Crocs have non-marking soles, and are antimicrobial and odor resistant. Some healthcare institutions don’t allow Crocs with holes in the top or sides since this is a spill and sharps hazard, and also some claim because they can cause a static electricity risk to equipment. My personal favorite brand for years. I can stand all day in these. But some users may have difficult getting used to the squared off heel and tight grip. For a work shoe that pulls double duty as a weekend companion, you can’t go wrong with Dr. Martens. This is one shoe that can go from a meeting to a work site without missing a step. Slip into a little comfort and resist the foot blues of a hard day’s work. Durable, comfortable, and handsome enough for a night on the town, these stylish shoes are a versatile choice for work or play. The uppers are crafted from Industrial full-grain leather for superior durability and soft, supple comfort. With a low-cut or high top, slip-on design, these shoes will keep your feet happy. Inside you’ll find moisture-wicking lining designed to move perspiration and wetness away so your feet stay dry and happy. Soft padded footbeds and cushion and support your step for all-day comfort. To keep you grounded, Dr. Martens added slip and oil resistant PVC outsoles for reliable traction on a variety of terrains. The soles are soft to prevent shock. They are sold in UK sizes so check the sizing chart. Rocky 4EurSole Shoes combine comfort, safety and durability with versatility and style. This hospital shoe features a 3-part system consisting of two interchangeable insoles and a decorative back strap. This allows you the option of rocking your shoe as an open back, strap back or full back clog. As if this medical shoe couldn’t get any better, Rocky 4EurSole shoes also features memory foam covered insoles and superior slip resistant technology, so you can feel comfortable and secure all day long. 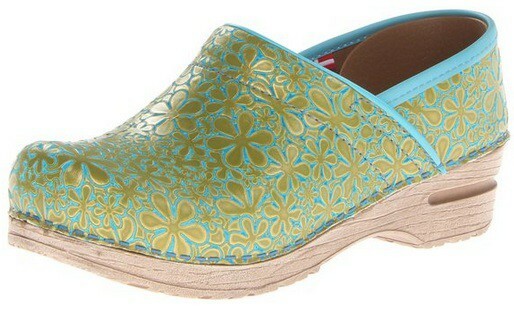 Alegria clogs are the luxurious alternative to basic hospital clogs! Alegria shoes come in a variety of finishes, prints and even patent leather. In addition to being practical and comfortable for your long days at work you now have the option of showing off your unique personality. Alegria clog foot beds are designed to form to the natural shape of your feet for ultimate support and comfort. 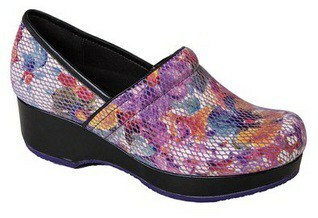 In addition to stylish prints and finishes, Alegria shoes also come in a variety of styles to choose from. Not only are Alegria shoes great for the feet but for your posture as well. I know some techs who swear by these. 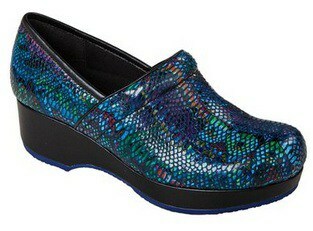 They like that the soles are a little more flexible than standard clogs and that there is a replacable insole. A variety of colors and styles are available.